When you think of a Brooklyn apartment, chances are that a spacious, cosy pad isn't the first thing that crossed your mind. Space is as precious here, if not more, than time. 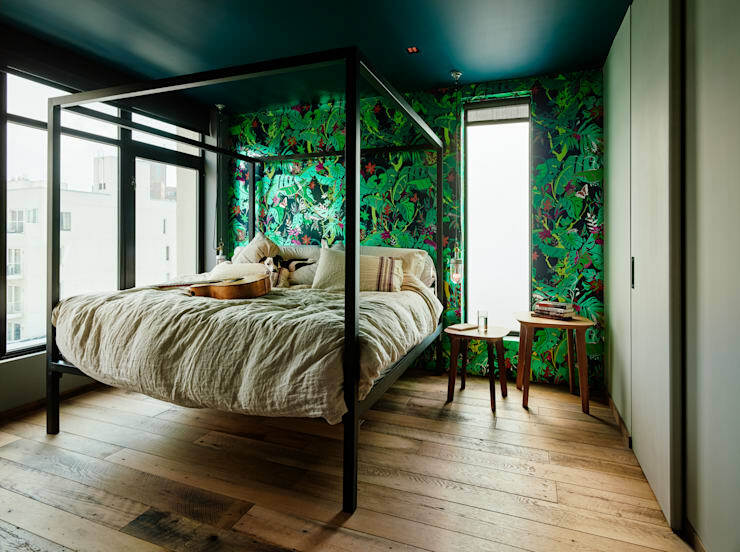 That though, is exactly what today's apartment is; designed by General Assembly, the stunning penthouse was created by merging two smaller apartments and is a wonderful example of mixing styles, materials and textures to great effect. Looking more like a casually put-together—albeit exquisitely well-planned,—apartment, it makes uses of art and (often vintage) accessories to provide a personal touch that sets it apart. Even though space was not in short supply here, the designers have not wasted any and put certain props on double duty. It's always impressive to enter a spacious, open, and bright apartment, but it can often be a challenge to make spaces like these feel comfortable. By using a few tricks though, the designers have managed to pull it off—gold star! The living room here has a lot of things going on, but at no point does it come across as jarring. The warm wood seen everywhere, and used in different capacities, ties the space together. Even the doggo is feeling the chill vibes! Statement pieces like this stunning wooden dining table (check out those stitches !) 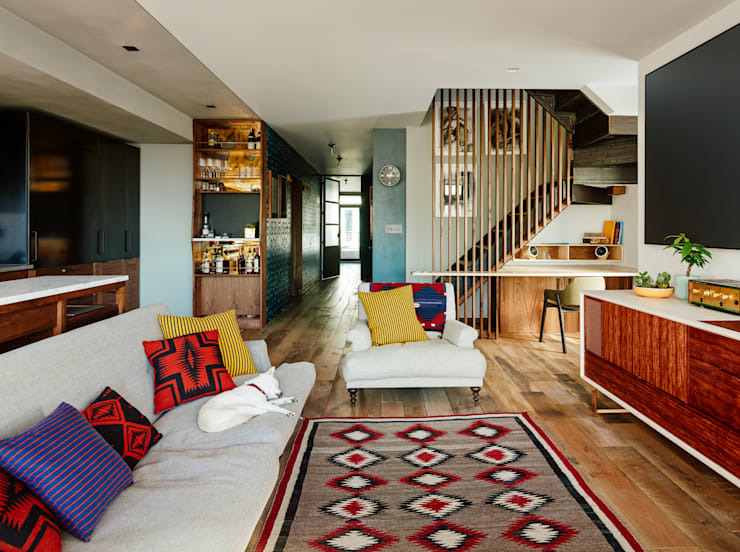 is strewn around the apartment, and gives it its distinctive Brooklyn quality. Notice the ultra-cool and mismatched seating that gives the dining area a laid-back yet industrial edge. When you're furnishing your home, it's always a good idea to rummage around in antique or boutique furniture stores where you're more likely to snag one-of-a-kind conversation starters such as these, instead of assembly-line products. It may take some time, but trust us, it's going to be totally worth your while! Once again, wood takes centre-stage. 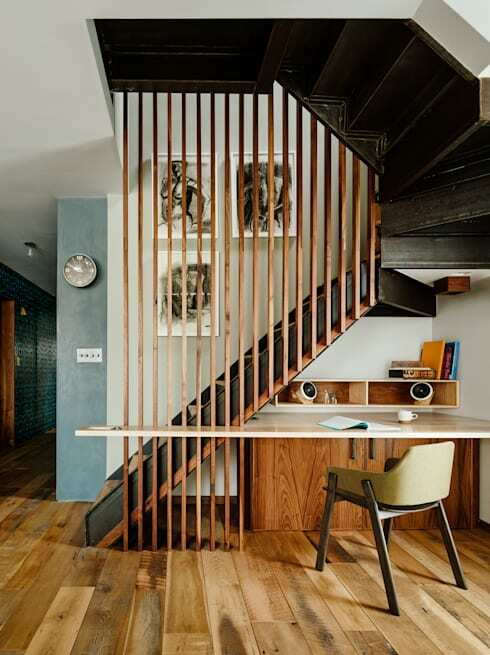 Here, it's used to create vertical slats that act as both an interesting visual element and as a balustrade (of sorts) to the staircase leading upto the bedroom upstairs. The area under the stairs is an often-underutilised space; here, it's been converted into a modern and minimal study. Incidentally, that cabinet you see behind the study actually houses a pull-out mattress and bed linens. For those days when you've been working overtime and are too tired to trudge upstairs to the bedroom? When it rains, it pours can have a very positive connotation—as is seen here. Look at that view of the New York skyline! The stuff of Hollywood dreams. It isn't just the view that makes this space so singularly awesome. The charmingly modern kitchen gets full points too. 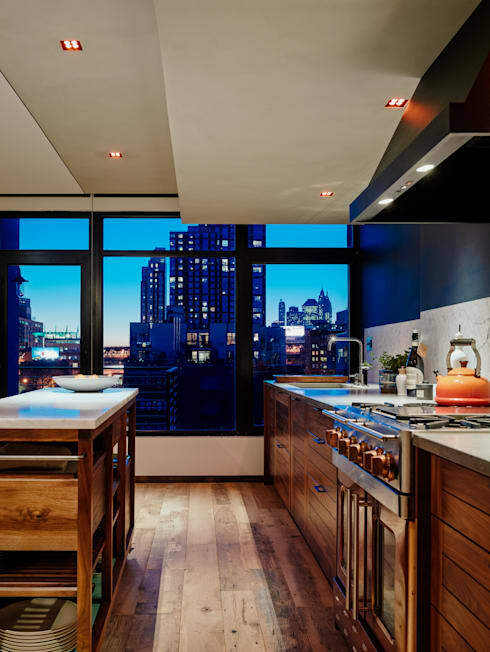 The wooden cabinetry and marble working surfaces immediately infuse the space with warmth. You can see what a difference an eye for detail can make—notice the vintage knobs on the oven! Get some ideas to replicate a stunning kitchen like this in your own home from our experts. You didn't think the bedroom would disappoint, did you? This lovely (and should we say romantic?) space is the smallest in terms of square metres in the whole apartment, but boy does it pack a punch! By sticking to minimal furniture (like the four-poster bed) and in-built storage, the designers let that fabulously colourful wallpaper do all the talking. You're not going to want to get out of here in a hurry. To see a completely different kind of modern apartment, check out: The perfect modern apartment. What did you think of this charming penthouse?